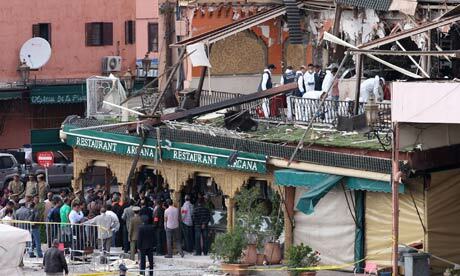 SALE, Morocco — A Moroccan court has delayed a terrorism trial over the bombing of a tourist cafe that killed 17 people. The MAP news agency said the court also increased the number of defendants on trial from seven to nine. After a brief hearing Thursday, the court delayed the proceedings until Sept. 22. The April 28 explosion was one of the worst terrorist acts to hit the North African kingdom. It tore through the Argana cafe in Marrakech’s old town, a popular tourist destination. Several of those killed were foreigners. Families of the defendants held a protest in front of the courthouse. The charges include premeditated murder and explosives-making. Moroccan police say the chief suspect, Adel Othmani, has loyalties to al-Qaida.